improves function at any age! Learn this exercise under the supervision of a healthcare professional so that you can enjoy all its benefits! 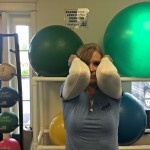 Brugger Exercise: For patients that had breast surgery, this will be a particularly important exercise as it facilitates improved lymphatic flow and decreases anterior shoulder tightness. It is also an excellent exercise to improve posture and facilitate correct breathing. Sit comfortably on a chair, back straight, chest up, head over the shoulders. Press your shoulders down as if carrying heavy bags. Open fingers wide and rotate through the upper arm so the shoulders open, pointing your thumbs behind you. Release to neutral and repeat 10 times. Seated butterfly stretch is a terrific way to mobilize and strengthen your hips and lower back. This exercise gently strengthens your abdominal and hip flexors and stretches your hip adductors (inner thighs), gluteal muscles and lower back. Begin sitting tall with a straight spine, placing the bottoms of your feet together in front of you. Use your outer thighs to draw your knees towards the floor, while holding your ankles. Use your abdominal muscles to fold forward. Hold the pose for approximately 30 seconds to 1 minute and repeat 3-5 times. Remember to breathe deeply throughout the exercise and try to release as much muscle tension as possible with each breathe! *Modification: If you are unable to maintain a straight spine, sit on a rolled up towel/yoga mat/blanket. 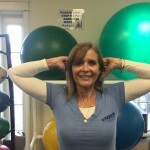 Elbow Curls are a terrific exercise to activate and rejuvenate the muscles of the upper back and shoulders. 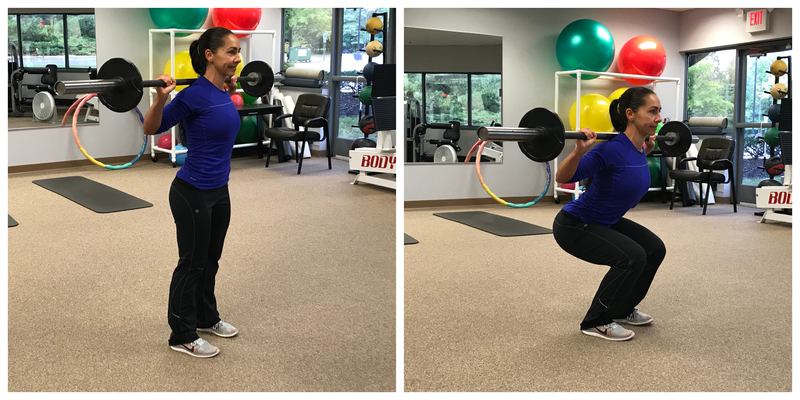 This exercise serves as a reminder to the shoulder to act as a hinge joint as well as a ball and socket. Elbow Curls are an excellent way to improve shoulder mobility, improve posture and overall shoulder and mid spine health. Place your knuckles on your temples with your hands in the golfer’s grip position so that your elbows are pointed straight forward. Pigeon Pose is an excellent stretch to open your hips and increase mobility. 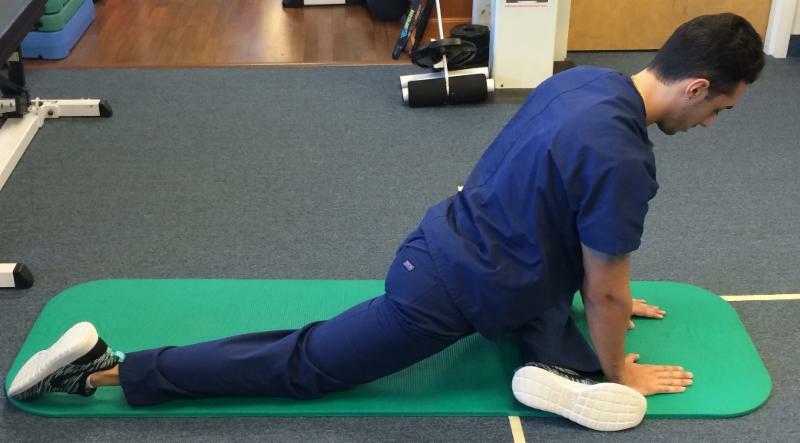 Increased hip mobility is directly related to improved lower back and knee health! This pose helps to increase the length of the hip flexors/adductors/gluteal muscles all which can become tight with prolonged periods of sitting. Begin on your hands and knees in the quadruped position (table position). Draw down through your front-leg shin and balance your weight evenly between your right and left hips. Press down through the tops of all five toes of the back foot. To release the pose, tuck your back toes, lift your back knee off the mat, and then press yourself back into hands and knee position. Repeat on the opposite side, 2-3x per side.